"Mail is one of the greatest morale boosters we can give our troops during the holidays." said Postmaster General John E. Potter. "When they see that package or letter waiting for them on their bunk or hear their name at mail call, it brings them that much closer to family and the comforts of home." Operation: We Love Our Soldiers - Click on this link to donate a stocking to a soldier. $30 will fill a stocking and they will ship it to Iraq in your behalf. Operation AC - Sending Supplies To Our Troops - Click on this link to Adopt A Service Member. You can order a 4 foot Christmas tree to be delivered to a platoon, as well as virtual care boxes, etc. Treat Any Soldier Care Packages - Click on this link to send a special care package to your soldier. These packages are designed to bring the comforts of home to our military personel. USO Cares Click on this link - for a donation of $25 you can sponsor a care package and include a personal message of support and encouragement for our troops. 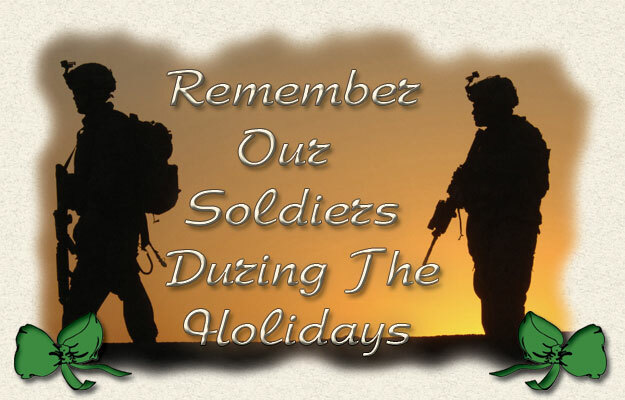 Soldiers Angels - Click on this link to order many of our soldiers most requested gifts. You can also order care packages, as well as gifts for the wounded.